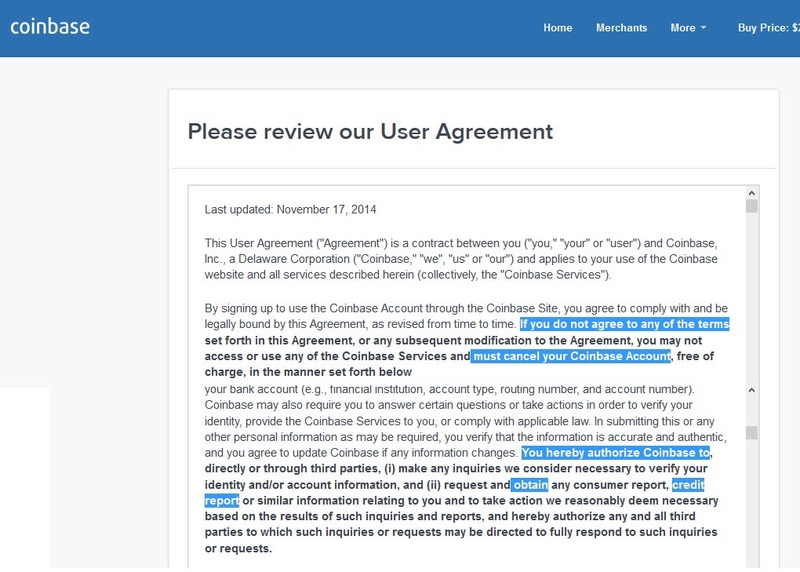 Coinbase has updated its User Agreement to allow the company, either directly or through third party intermediaries, to collect credit histories from its 1.9 million users. Coinbase was recently accused of tracking how its users spend bitcoin purchased on the website. One user´s account was closed after he used his coins to buy cannabis seeds and another was closed because he bought coins on Coinbase and apparently sold them on Localbitcoins. While the use of coins to purchase such seeds could be questionable from a legal standpoint, selling your coins on another website is certainly not. The California based company defended itself by claiming that these steps were necessary if they wanted to remain in compliance with regulations. Of course, these regulations do require companies to verify identities (Know your Customer) and monitor for possible criminal activity such as drug purchases and money laundering. But do these regulations require a company to pry into a customer’s credit history? Armstrong wanted to make it clear that user privacy was important to Coinbase, but if the company was going to be able to provide customers the ability to move between Bitcoin and their banks, regulations must be complied with fully. The company does accept verified credit cards and recently began allowing instant use of Bitcoin through its “USD Wallet”, which allows users with a US bank account to do an instant ACH bank transfer. “I've been with Coinbase literally since day one. Love their service. Love the site. And I'm the last guy to care about regulations or rules or authority. But I'm not comfortable with them running my credit report. So I guess I have to cancel. The fact is that Coinbase is a business that seeks to work within the legacy economic system, which of course means following the rules. But Coinbase is also an enterprise that wants to take advantage of any profit potential that might become available. Anyone doing business with companies such as Coinbase should understand this and, if privacy is an issue, then it is probably better to find a less intrusive Bitcoin service provider to use as your wallet.